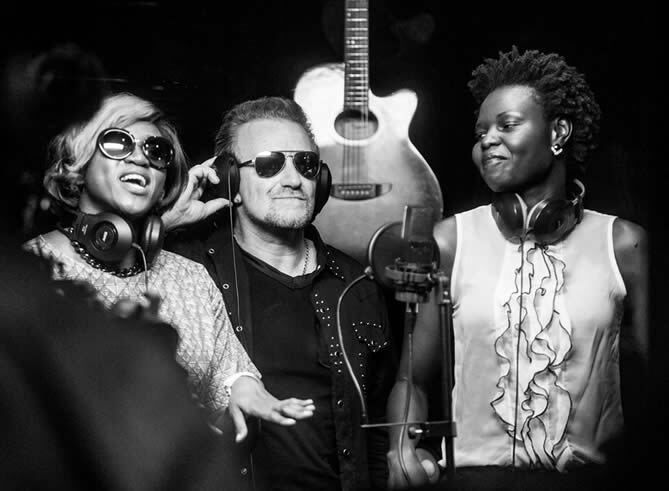 Bono joins African artists to record "Strong Girl"
U2 lead singer and ONE co-founder Bono is teaming up with nine of Africa’s most talented artists for the advocacy organization’s “Strong Girl” remix – an anthem encouraging women around the world to stand up against sexism. The song is part of ONE’s “Poverty is Sexist” campaign aimed at eliminating sexism in developing nations, and is a call to action pressuring leaders to empower women to rid their communities of poverty. The remixed version of “Strong Girl” also features some leading men in the African music scene backing up the women who originally sang and wrote the song, including Arielle T, Blessing, Gabriela, Judith Sephuma, Selmor Mtukudzi, Vanessa Mdee, Waje and Yemi Alade. ONE’s anti-sexism campaign also encourages people to post pictures of themselves doing the iconic Rosie the Riveter bicep flex on social media with the hashtags “#Strengthie” and “#WithStrongGirls”. So far, ONE’s petition has garnered 1,042,503 signatures – 83% of its 1,250,000 signature goal. To sign ONE’s “Poverty is Sexist” petition, click here. ONE is working to help alleviate the many challenges women face in developing, poverty-stricken nations such as being denied education, being forced into marriage, and the prohibition of women farmers from owning the land on which they work.